The Old Faithful area, also known as the Upper Geyser Basin, contains the largest concentration of geysers in the world. Yellowstone, as a whole, possesses close to 60% of the world’s geysers. The most well-known feature of Yellowstone is of course Old Faithful Geyser. It is not the largest geyser but it is one of the most regular and predictable (erupts about every 90 minutes). The Upper Geyser Basin self-guided tour starts at Old Faithful and runs for several miles on boardwalks, paved trails, and unpaved trails. The ambitious can hike or bike the three mile trails to Biscuit Basin, the north end of Upper Geyser Basin. Most of the popular features are along the boardwalk trail. They consist of geysers, hot springs, and hot pools. Most geysers erupt infrequently or at unpredictable intervals. 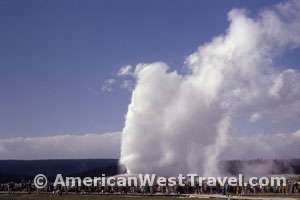 (The predicted geysers are Castle, Grand, Daisy, Riverside, Great Fountain (in Lower Geyser Basin), and Old Faithful. Time forecasts should be available at the visitor center. Check out the timetable for Grand Geyser, the largest predictable geyser. The numerous hot springs and pools often have strange formations due to the mineralization and fantastic colors due to the bacteria. One of the favorites is the Morning Glory Pool. The Sapphire pool at Biscuit Basin is also very beautiful. Note: Bison often frequent the Upper Geyser Basin near the river. Continuing up the road to Madison, you arrive next at the Midway Geyser Basin which features the park’s largest hot springs, Grand Prismatic Spring, and the huge crater of Excelsior Geyser. A couple miles farther north is the Lower Geyser Basin, another area of substantial thermal activity. There is another boardwalk trail here featuring the exotic Fountain Paint Pots and three mile Firehole Lake Drive featuring splashy Great Fountain Geyser. For those wanting to hike the backcountry to a geyser area, a five mile round trip trail leaves the road just south of the Old Faithful area to the Lone Star Geyser Basin. Backpackers or strong hikers can do the 17 mile round trip hike to Shoshone Geyser Basin, alongside Shoshone Lake, south of Old Faithful. Shorter route: Park 1.0 mi (1.5 km) south of Midway Geyser Basin, cross steel bridge, walk 1.0 mi (1.5 km) to the trailhead. Longer route: Park at the end of Fountain Flat Drive and walk 1.75 mi (2.8 km) to the trailhead. From the trailhead, walk 1.6 miles (2.6 km) through a young lodgepole pine forest to the falls. You can continue 0.6 miles (0.97 km) to Spray and Imperial geysers. This adds 1.2 miles (1.9 km) to the hike. Bear management area: Trail opens in late May. Mystic Falls Round trip 2.5 miles (4 km), moderately strenuous. The trail begins at the west end of the Biscuit Basin boardwalk near Avoca Spring about 2.0 miles/3.2 km north of Old Faithful. (You can also begin 0.25 miles/0.4 km south of Biscuit Basin. Park in pullouts on either side of the road.) The trail parallels, but does not cross, the Little Firehole River for 0.7 miles (1.1 km) The trail climbs steeply to an overlook of the falls, which are 70 feet (21 m). To make a loop hike, which is 0.2 miles (0.3 km) farther with elevation gain/loss of 500 feet (152 m), continue on the trail above the switchbacks until it meets the Little Firehole Meadows Trail. Turn right, descend to an overlook of Old Faithful, and continue downhill to rejoin the Mystic Falls Trail. Bear management area: Trail opens late May. Lone Star Geyser Round trip 4.8 miles (7.7 km), easy. The trailhead is east of Kepler Cascades pullout, 3.5 miles (5.6 km) southeast of Old Faithful overpass on Grand Loop Road. This level trail and bicycle path follows the Firehole River to the geyser. Lone Star erupts 30–45 feet (9–14 m) about every three hours. Biking is not permitted beyond a barrier near the geyser. Detailed Old Faithful Area Map. Exploring the Old Faithful Area. Official NPS guide. Old Faithful Area Day Hikes. Numerous trails suitable for short or extended hikes into Yellowstone’s backcountry. Why is Old Faithful Famous? Old Faithful Inn. May to October. Located a short walk from the famous geyser, the inn, with 273 rooms, is the most requested lodging in the park. Consists of a rustic-style lodge dating from 1903-1904. with two wings added later. Simple, yet basic rooms in the Old House with either a private or shared baths. East and West Wing offers premium (view) or standard modern rooms with private bath. Semi-Suites with sitting area or Suites with sitting room/refrigerator (private bathrooms) are available. Some ADA accessible rooms available on first floor. Televisions, radios, and A/C are not available. Large towering lobby with a massive stone fireplace. Features a full-service restaurant, lounge, snack bar, gift shop and daily tours. Old Faithful Lodge Cabins. Mid-May to mid-September. Historic cabin facility located near Old Faithful Inn and includes a one-story main lodge built in the 1920′s featuring massive logs and stone pillars. Rustic cabins with private or shared baths. Televisions, radios, and A/C are not available. Lobby houses bakery/snack shop and cafeteria-style food court. Views of the Old Faithful Geyser can be seen from the lobby area. Old Faithful Snow Lodge & Cabins. Early May to late October. Newest facility in the park. Lodge rooms with full bathrooms, telephones, coffee makers, refrigerators and hair dryers. Upscale and basic cabins include private bathrooms. Some lodge rooms and cabins are ADA accessible. Televisions, radios, and A/C are not available. Lobby houses a full-service dining room, quick service grill, and gift store. Winter season, open from December to March, with special packages. Grant Village Campground. Open: Late June to late September. Located on west side of Yellowstone Lake, about 22 miles from South Entrance. Large campground with 430 sites. Rates for this campground include 2 showers per night. No utility hook-ups, dump station nearby. Flush toilets. Services, stores, pay showers, and coin laundry located nearby. Short drive to West Thumb Geyser Basin. Half of sites in meadow area with no shade; others are wooded. Forested campground, well spaced out. Modern facility. Tent-only loops available. Generators allowed from 8 a.m. to 8 p.m. Reservations are available. Lewis Lake Campground. Mid-June to early November. Located about 10 miles north of park's south entrance adjacent to lake. Small campground with 85 sites. All sites are 25 feet or under (very few pull throughs). Vault toilets. Campground away from developed areas. Boat launch available. Generators not allowed. Madison Campground. Open: Early May to late October. Located 14 miles east of the West Yellowstone entrance and 16 miles north of Old Faithful near the junction of of the Gibbon, Madison, and Firehole Rivers. Large campground with 278 sites. Flush toilets. No utility hook-ups, dump station nearby. Campground away from developed areas. Generally open, level sites, lightly wooded. Tent-only loops available. River overlooks, fishing on Madison River (famous for brown trout) within walking distance. Generators are allowed from 8 a.m. to 8 p.m. Reservations are available. The new Old Faithful Visitor Education Center, located near Old Faithful Lodge, features exhibits on hydrothermal features, life in extreme environments, and volcanic geology. Includes a theater and large Yellowstone Association book store. Geyser eruption timetable predictions are available here. Ranger-led programs during summer and winter seasons. Ranger station, backcountry office, and medical clinic located nearby. Open late April to early November. Reopens in December for winter season. Food services, general stores, gift shops, gas station, post office, and picnic area.